XYZero, Thanks for the explanation and how to change the file association. Yes, I have Adobe software. The links are the genesis 3 woman in Daz(duf) and also the same G3 woman animation imported into Blender(blend). I was initially trying to get a snake’s animation to work in Blender but I decided I wanted to test if could even get a generic Genesis woman character’s animation to work in Blender. I couldn’t so I uploaded it here instead of the snake because it’s something every Daz owner reading this would already have and could relate to what is being described(generic Genesis 3 woman) even if they don’t download the files I linked to. Aha, aniMate! Unfortunately, the plugin cannot import animations made with animate, only those which consist of keyframes on the timeline. In some earlier version of Daz Studio it was possible to convert animate animations to keyframes, but I cannot find such an option in the current version. Also, I notice that the rest pose is wrong. Export the json file when the character is in her rest pose. The json file contains the final world space locations of vertices and bones, and whatever those are, they will define the rest pose in Blender. The reason is that some poses in fact are parts of the character definition, e.g. leg length is implemented by scaling the thigh and shin bones. If you import the file with Mesh Fitting set to one of the Unmorphed options, the character is posed but it has the right rest pose. But then you lose all morphs and only have the base G3F. One can convert the data string to a sequence of bytes with binascii.a2b_base64 without errors, but I don’t know what to do with those bytes afterwards. Found it. 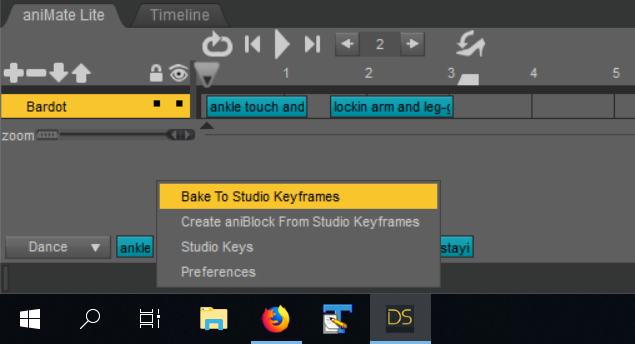 In Daz Studio, right-click in the grey area below the aniblocks in the aniMate tab, and select Bake to Studio Keyframes. Then save the duf file. You can now import the animation with Import Action. I would recommend keeping two duf files, one where the character is defined in rest pose, and one with the animation. Thanks, Thomas. I had previously experimentally tried importing baked and non-baked aniblocks but what got in the way of even that was what you also pointed out that I was doing wrong, not initially importing the rest pose(I had imported the animation and then redundantly reimported it under ‘import action’). Thanks to your help and software, the animation now does import. It’s imports at 26(looks like 26, not 24) frames in Blender instead of 30(Daz) but my Blender file is set to 24fps vs Daz at 30fps. To fix, I then started off pre-Daz-import with a 30 fps Blender file but it still imports 26 animation frames like 2nd attachment shows, but I’m not through experimenting. 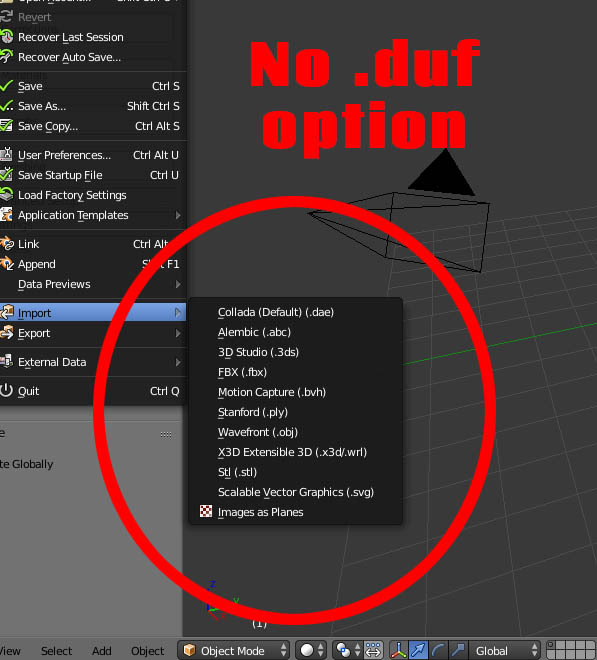 What I noticed this time around is that, in Blender File>import, duf used to be an option but now isn’t(see attached image) which isn’t a problem because the Daz Runtime tab is there but is there a reason why a .duf option is no longer seen under import? it’s something every Daz owner reading this would already have and could relate to what is being described(generic Genesis 3 woman) even if they don’t download the files I linked to. I see, sorry for the confusion, haven’t used daz studio for a few years, just got back into using it again last week. It took a few hours to redownload all of my purchases and aware that G3 and G8 comes with daz studio. Has been lots of changes. No confusion. I was just explaining to anyone reading why I had talked about a snake but uploaded a woman. I appreciate your responses, help, and explanations. The menu entry was removed because it did not work in B2.80. Restored now, and it works with B2.80 as well. 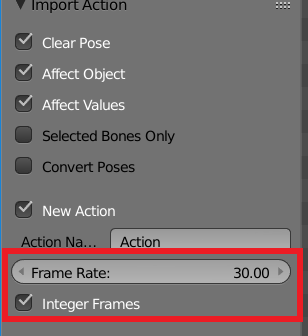 The frame-rate is controlled by the Frame Rate field in the import options, not by frame rate in the scene settings. By default it is 30, because that seems the most common one for Daz files. A test animation, which has 216 frames at 30 fps in DS, ends at frame 216 if Frame rate is set to 30, but it ends around frame 173 if 24, which should be about the right timing at 24 fps. If the Frame Rate option is not equal to the frame rate in the Daz file, some keys are created between integer times, unless the last option is checked. Non-integer keyframes may perhaps lead to problems with interpolation between angles. Thanks for your reply and additional information, Thomas. I’m going to continue to experiment a little more and also continue studying what you have already documented on your Diffeomorphic blog. Edit: problem solved, shouldn’t install anything from inside DAz, but have to use DIM. I’m having a problem importing the daz assets. it’s a new install, previously on an other machine i had it working. but apparently it’s not enough… what is this connect library anyway…? as a library path. The plugin looks for paths by concatenating the DAZ paths with the path in the duf file. It does not look in subdirectories, but if this is common and there are many different subdirectories under data/cloud maybe it should. Yes probably, but there were like 5 numbered folders already… i could had set up paths for each i guess… but anyway, it’s working now. One small problemI found with the mhx rig: the hand ik bones can’t be mirrored by ctrl+c/shift+ctrl+v. The plugin has been changed to look for assets not only at the paths specified in the list, but also in any subfolder whose name only consists of digits and underscores. So if you change the settings back to what you had, the importer should find assets in all five numbered folders. How do i import the facial expressions? When i try to load the expression it show only a couple of then. Also is it possible to import expression as Pose Library? I tried but it didn’t work, if it’s possible which files i should load? Thereafter, DAZ Runtime -> Morphs -> Check Show Expressions, check some exp., and push Load Expressions button. Don’t forget change layer to . Hey everyone. I would like to see an easy way to animate the face. Maybe a face rig, but still using Gen 8 bones. Thanks for the answer, but it didn’t load any other expressions. It might be something wrong with the paths in here. The ones that load work fine. Do you know how/where the importer search for the morphs? Thanks Thomas for this awesome addon, I just started to play with it. I am using blender 2.8 and eevee. When importing a character from DAZ I get way too much translucency. Setting the mix shader which adds translucency to 0.1 gives more reasonable results. Is there a way to reduce translucency in all skin materials (torso, arms etc.) from the addon without editing all materials manually? Hi all, thanks Thomas for your work and all for sharing experience. Strange thing is that, the tiny differences come only in some of the keyframes and some are just perfect! For example, a hand that has grabbed or is holding something, appears just perfect in some cases, as each finger bone was done in Daz, and is some cases, the hand is slightly moved from its location, so it does not appear to “hold” the object it was holding(created in Daz). When the correctives are loaded, it resolves problems like edgy torso bending, or arms twisting, but it does not fix the problem stated above. So, my option was to Import Driven poses, so I can change the minor issues manually afterwards. Still, when the import is done, it seems the ctrls for the bones that appear (the sliders from Daz) does not remember and recognise values for the poses from before and totally mess them, in a way I cannot still figure which bone exactly is the problem or whatsoever, cause the pose looks completely different. The other way around, If I load the base models(with jsons) and first Import Driven Poses (before Action import) the ctrls are working fine - I can manipulate the bones with them in Blender. When the Action is imported, they do not change, the poses wanted are not loaded/imported. Is there a way to make them both working together so I make just slight changes to the poses needed and not fully re-do each of them? Added a new button in the Materials section that changes translucency consistently of all materials: Change Translucency Strength. It multiplies the mix factor with Translucency Factor, in analogy with the Change Bump buttons above it. 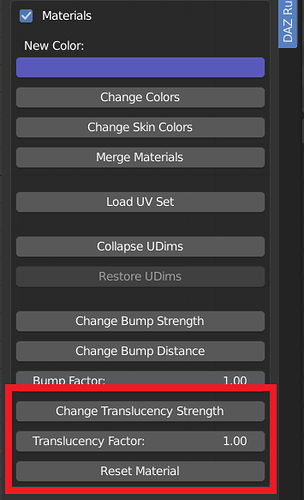 Reset Materials restores both the bump and translucency settings to their original values.